We hear a lot about science communication these days. More and more, scientists are attempting to convey something of the fascination and wonder of their work to a general audience. But imagine for a moment a radio program, devoted solely to natural science, a radio program that ran for twenty years on commercial stations from 1938-1958. A quirk? An oddity? Imagine now that this radio programme reached more than 70% of the listening audience. Impossible? No -- this was the achievement of pioneering science broadcaster Crosbie Morrison. After completing his Master of Science at the University of Melbourne, Crosbie Morrison worked with the Melbourne Argus, at first as a general reporter, but later specialising in science. In 1938 he was appointed founding editor of Wild Life, a popular magazine devoted to natural history that became one of the best of its kind in the world. 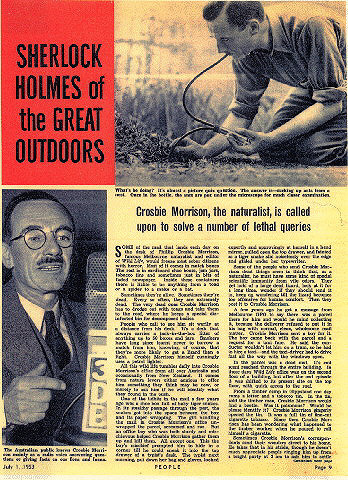 As a means of publicising the first issues of the magazine, Morrison gave a series of nature study broadcasts on the Melbourne radio station 3DB. These were so well received that the series continued, eventually reaching audiences across Australia, New Zealand and South Africa. Morrison was flooded with questions from enthusiastic listeners, so enthusiastic that opening his mail could be a messy business - sometimes snakes or spiders were included for identification! Many years before the rise of the modern environmental movement, Crosbie Morrison was using the media to raise awareness of the need to conserve our natural environment. His broadcasts and articles covered a wide range of issues, many of which are still of vital importance. These included soil and water conservation, the use of animals in sport and in scientific experiments, the illegal export of native birds, and the planting and preservation of trees. But there was need for action as well as words and Morrison's concerns culminated in his vigorous lobbying for effective control of Victoria's national parks. A National Parks Act was passed in 1956, and Crosbie Morrison became the first director of the new Victorian National Parks Authority in 1957. Crosbie Morrison was a skilled communicator with a sincere and lasting commitment to the promotion of a scientific understanding of our natural world. If he had been alive today he would no doubt be carrying his message ever further afield, utilising modern communications technology. Imagine it -- perhaps "Crosbie's Backyard"? Previously published in Australasian Science, vol. 1, no. 4, Summer 1992, p. 8.